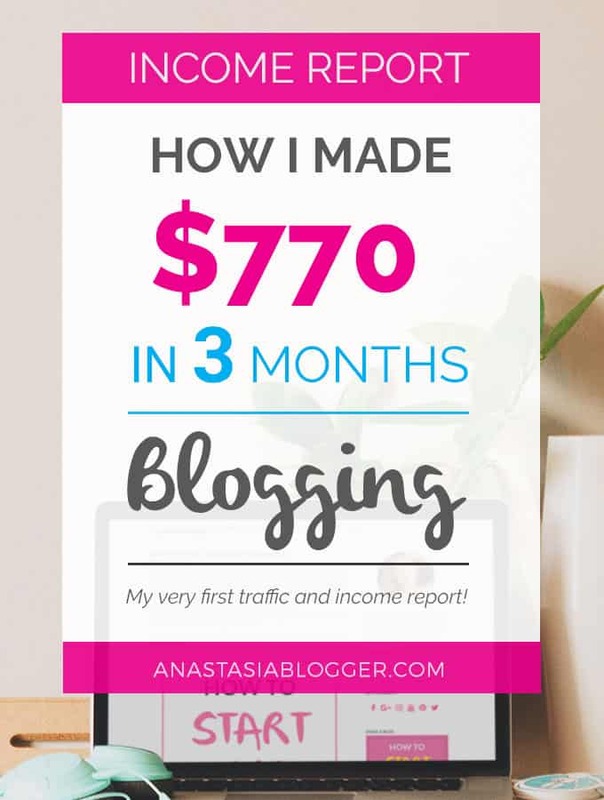 My First Income and Traffic Report on AnastasiaBlogger.com! My first Income and Traffic Report! 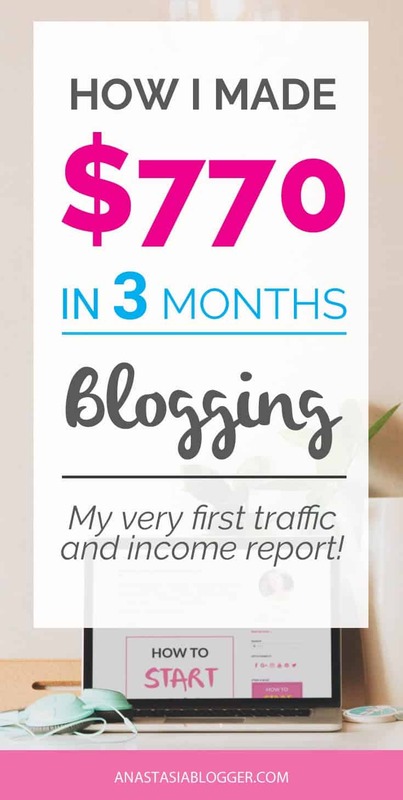 Well, here I am, writing my first income and traffic report for this 3-month-old blog! I started it somewhere in the middle of Feb, but first 2 weeks were spent mostly for setting everything up for the blog, including design, SEO basics, social media accounts, etc. If you are interested to see how you can also start your blog in about 10-20 min, I have a detailed post about it here. I have to reveal that I’m not yet a full-time blogger, I have a 9-5 job, which I hope this blogging project will help me to quit. So, I would say, the blog is currently a hobby, a side-hustle, and I spend working on it about 1 day a week for now. This was an important note for those who are just thinking to start a blog. Believe me, you won’t be able to earn living from blog in the first couple of months, no matter how hard you work on it. I know that some bloggers do it the other way, they spend a couple of months preparing some content, which they publish once they accumulated at least 20+ posts, and so their newly created blog has a strong start with lots of content. If you have the patience to write 20+ posts and keep them in stock, this would be the best for you! I had no patience, so I started by blog with just one post and then was publishing about 3-4 new posts a month. Like I said, it’s not yet my full-time job. For the amount of time I spend on the blog, I’m quite happy with the results I’m having so far. Let’s take a look at numbers! Please note, my blog is still new and so I publish an income report based on the income and expenses I have by the end of the third month, it’s not a one-month income, nor expenses. This post contains affiliate links to Bluehost. This means I might receive a commission if you buy their hosting using my link. For more information, see my disclosures here. Bluehost hosting with a free domain for 1 year – $99. Great deal, because they also gave me a free SSL certificate! Tailwind – 1-year subscription for $90. I’ve got a referral credit of $30, normally the price per year is $120. You can have one month of Premium or spend the 30$ credit to get a discount on your yearly subscription with my referral link. I started my blog in the middle of February 2017, I created a whole new Pinterest account associated with my blog, so I had 0 traffic and 0 followers for starters. In 3 months, if we compare monthly traffic for Feb and May, I’ve got 10 times more pageviews! With a new blog, you can hardly rely on Google traffic because it takes months until Google gives proper trust to a newly created site. So, guess where does my traffic come from? Pinterest! About 94% of my audience comes from Pinterest! Some of my best Pinterest tips and tricks I learned hard way during these 3 months, I have shared with you here. I hope it helps you grow your blog too! It’s possible to pay off all your initial investments and earn some extra from a completely new blog in just 3 months working on it about 1 day a week! So if you are about to quit your job for blogging, I’d recommend you to start with part-time blogging and then see how it goes with income growth. You could also take a look at other work from home opportunities while your blog is still in the growth stage and can’t pay all your bills. Pinterest rules for traffic! Google takes about 6 months to give at least some trust to a new blog. Pinterest allows you to grow traffic fast and almost for free. Your biggest investment is time! Tailwind rules for growing your Pinterest boards faster! Affiliate marketing rules for making money on a new blog! iGain has been my best paying affiliate network so far. You can register as their affiliate here. When your blog is young and has not much traffic, you can’t rely on Google Adsense or other ad networks because you’ve got very few pageviews to make anything decent on ads. Direct advertisers will not notice you for the same reason – you are new, low trust, low traffic. Also, to sell your own products, you need time to create them, this is not easy for someone who is just starting a blog. So, I believe, affiliate marketing is the best way to make money from a new blog! Thank you for your kind words 🙂 I hope you can learn something from my reports and increase your blogging income too!